We were catching up with a couple of old friends for dinner and decided it was finally time that we tried out the vegan options at Shop 225. 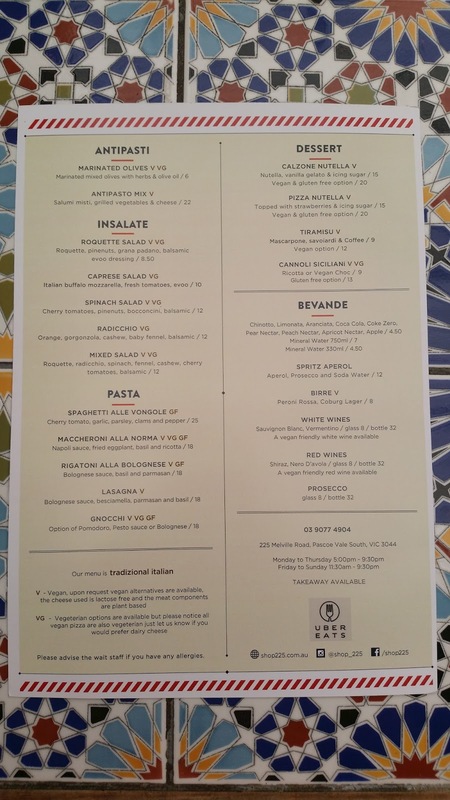 Tucked away on Melville Rd, 225 is a traditional Italian pizzeria that has for some reason decided to provide a full vegan menu alongside its regular offerings. 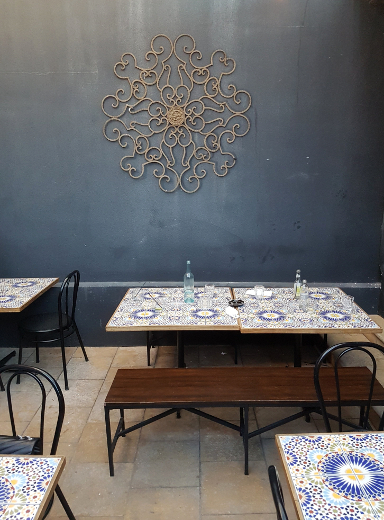 We sat out in the courtyard at the back and sampled widely from the menu. 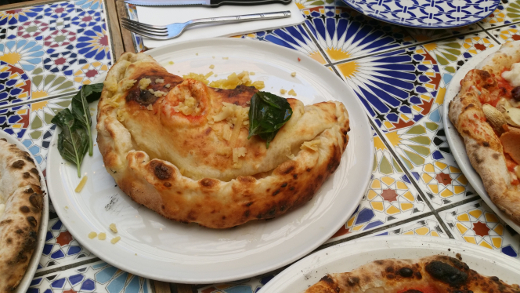 We were somehow talked into ordering the vegan calzone ($20), stuffed with tomato sauce, mock ham, fake cheese and real basil. I was sceptical, but this was an absolute delight - dense and delicious. I'm coming around to Ben Wyatt's point of view. 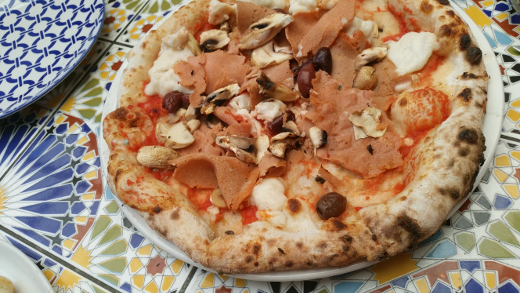 We also ordered a cappricciosa ($19), topped with tomato sauce, fake cheese, mushroom, olives and mock ham. I loved this one - they use a variety of mock meats, so when you get 'ham' you get something different to the salami or pancetta. It's a nice touch. 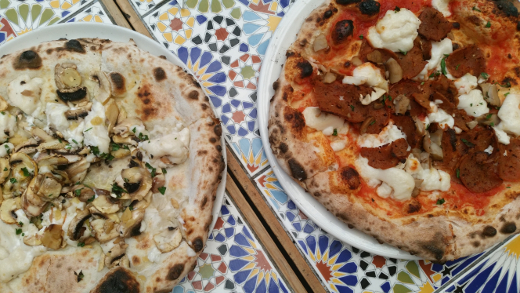 Our other two pizzas were a zio pino (mushroom, parsley, multiple mock cheeses and truffle oil ($20, left) and the il dottore (mock sausage, mushrooms, tomato sauce and mock fior di latte, $25, right). These were both pretty successful as well - the toppings are generous without being overwhelming and there's a good mix of mock products and veggies to go around. Obviously the cheeses don't have quite the depth of flavours as the non-vegan alternatives, but they're surprisingly good and the rest of the toppings are diverse enough to keep things interesting. 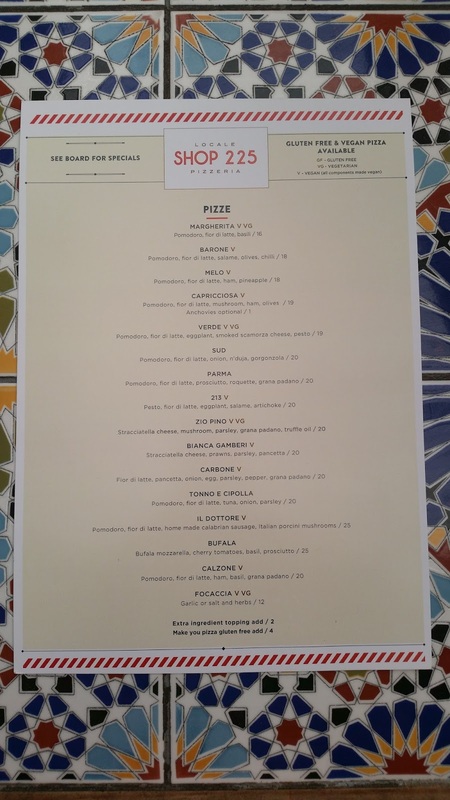 We had a really great meal at Shop 225 - there's so many vegan dishes to try out and they promise good gluten free pizza bases and pasta as well. The staff were super friendly (even talking us into buying some of their magnificent vegan nutella) and the courtyard was gorgeous on a sunny evening. 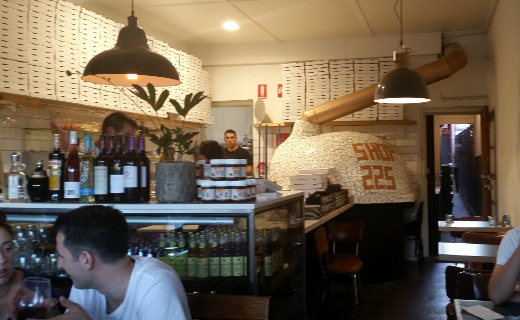 Is it the best vegan pizza on offer in Melbourne? Red Sparrow is good, but our consensus was that 225 is better. Without travelling to Sydney you're not going to find a better vegan pizza option - check it out. Veganopolous and THATVEGANLIFEDOE loved the early incarnation of this place, while Fitzroyalty loved the food but was annoyed by the dominance of Uber Eats orders.. There are a bunch of freebie reviews since the new owners took over that are unsurprisingly positive (see Penguineats, Lips Temptations and Fire & Tea). Accessibility: There's a flat entry into a pretty crowded interior. We sat in the back courtyard which is accessible only via a crowded and narrow pathway. The toilets are unisex, but up a few steps. This place sounds great! I like Red Sparrow a lot, but I wasn't as blown away by it as I was expecting after hearing all the rave reviews. I will add this place to my list. BTW - Gigi's pizza is coming to the Gold Coast! I am so excited!! Now if only I could convince Gelato Blue to come along as well, my perfect Sydney food night would become just a relatively short drive away. Susan, I am so excited (and more than a little jealous) about the GC Gigi's! Hope Shop 225 is a worthy Melbourne alternative on your next trip - it's a bit out of the way from your usual CBD and Fitzroy faves. I've swithered over if I should go here but your review does make it sound very tempting - it is too long since I had a calzone! Though I had my first Gigi's pizza last night so perhaps let that memory dull a little as it is a high bar to measure any pizza against! Johanna, I think Shop 225 is worth at least one shot and it's a bit closer to home for you and I.